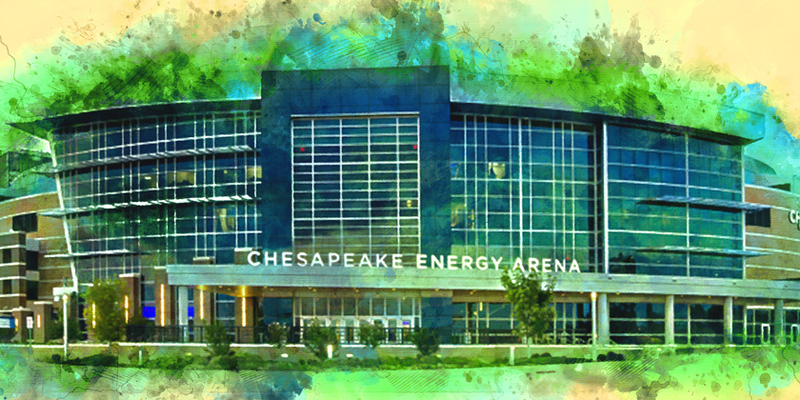 Located in the heart of Oklahoma City, the Chesapeake Energy Arena welcomes over 1 million guests for a variety of world-class events each year. With over 586,000 square-feet of event space, the arena can easily transform from an NBA basketball court, to an NHL hockey rink, to a 16,591-seat capacity concert venue. The Peake has hosted over 10 million fans and more than 1,200 events since opening its doors nearly two decades ago. Home to NBA team the Oklahoma City Thunder since 2008, the arena has also served as home to Central Hockey League team the OKC Blazers, Arena Football team OKC Yard Dawgs, and NBA team the New Orleans Hornets (for two NBA seasons following Hurricane Katrina). The arena is owned by the City of Oklahoma, and its construction was the premier project of OKC’s visionary Capital Improvement Program to finance new and improved sports, entertainment and cultural facilities. It has undergone several improvements since first opening its doors in 2002, including the addition of new restaurants, clubs, video boards, terrace suites and lounges and a grand multi-story atrium entrance. Whether you’re there to cheer on the OKC Thunder from the stands or sing along with your favorite artists during a live concert, we’ve got you covered on everything you need to know before you go. Read through our insider’s guide before your next visit to the Chesapeake Energy Arena!